As a classical pianist Louise found that during long practice sessions, the necessary mental focus gave her relief from emotional stress. Later she discovered that a similar but more profound state of peace and calm could be cultivated through meditation and mindfulness, and swapped her piano stool for a meditation cushion! After years of teaching primary classroom music, she realised that there is a great need for children to learn some tools to help them de-stress and better cope with busy lives. Beginning with the simple practice of breathing, Louise introduced some meditation activities into her classes and discovered that children are quite capable of looking into their minds and really enjoy the process of cultivating a calm, peaceful space within. It is a wonderful antidote to screen overexposure. 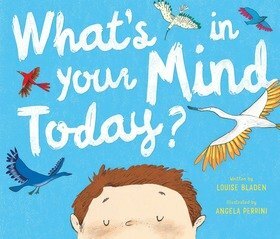 This wish to simply convey the great ancient tool of mindfulness and her great love of children’s picture books results in What’s In Your Mind Today? From her experience in teaching meditation to adults, Louise can also recommend this book as a good starting point for adults who wish to learn basic meditation technique. When Louise isn’t sitting on her meditation cushion looking at her mind, she loves painting in watercolours, swimming, watching musicals and walking her four-legged canine friends Maggie the Hairy and Harry the Smooth, accompanied by her two-legged husband John.